← Calling all prospective moderators! Hey folks. Been a couple of months since I’ve posted anything about new development on the site, so I figured you were all due for an update on what’s been going on, and what’s coming soon. This should tide you over for the next couple of weeks, as I’m going to be a little quieter than usual on the site. No, nothing to worry about — rather, it’s something that should get you excited instead: I’m in the midst of heavy-duty development of groups (a.k.a. : writing circles) and the first phase of this pretty elaborate new feature should be ready to go up on the site in the next 10-14 days. As most of you are probably aware, I’ve been slipping in new features and tweaks left and right since the beginning of the year, probably right under the noses of regular site contributors who may still not have noticed them. I’ll start off by detailing a few of these new additions and changes, and I’ll follow that up with a summary of what you should expect in the next few weeks. Revamping the homepage for new users was an experiment on my part that worked out quite favourably. Since shortly before this year’s SXSW Interactive Festival (at which Protagonize was a finalist in the Community category of the Web Awards show), I’ve been trying to work out new and interesting ways to promote and growing the site. Redoing the homepage to do a better job of explaining what Protagonize is about to potential new members was an important step in this process. Better yet, it’s not overly intrusive, as it only shows up for unregistered, not-logged-in people browsing the site. Overhauling the main site navigation was driven primarily by the growth of the site. I added the extended footer last fall to accommodate folks trying to find stuff a little easier, but it wasn’t really cutting it. It’s a nice extra, but definitely doesn’t resolve general navigation issues. I felt that switching from our old-style, single links in the top navigation to a drop-down structure — which is understandably a little more complex to use for newbies — did a lot more to improve navigation of the site than it detracted in terms of ease-of-use. If anything, it also allows me to add new sections to the site without running into the dreaded “where do I put this link?” issue that I was seeing frequently before. At the same time, it lets you get to areas you may not even have been aware existed on the site, which is doubly important as they were areas of the site not generating much traffic prior to the overhaul that are now being noticed and used. I’m on a bit of a quest to incrementally improve the “community” feeling of the site, all the while improving usability and clarity so that our users can find what they’re looking for without confusion. In that spirit, I changed all of the author listings over to showing your portraits where the rankings and ratings used to be visible. This meant relegating overall ratings to the lower part of your author listings, which was a tough decision. At the same time, even to me, the change really emphasized that you’re all real people and not just another name in a big list of authors; little changes like this can have a surprisingly intense impact when put into play. It allows you all to express a little personality and individuality that may just catch the eye of a curious reader without having to write anything to do so. More recently, I tweaked the story listings at darkliquid’s suggestion over on our help center; now, you can see a story’s categories and tags at-a-glance, in addition to story summaries (which I introduced earlier.) I’m hoping this has done as much in improving your story browsing experience as the author listings tweaks did to increase the sense of community on the site. I’ve made a bunch of little visual tweaks and changes throughout the site, including moving story/profile editing and settings over to buttons below stories’ headings, moving the share button up to a more visible area, cleaning up the item actions at the bottom of stories and profiles, making the profile editing form a little more usable, adding help flyouts througout most of the site’s forms, and more. These are all little updates that I’ll keep making on a regular basis, as I find bits and pieces of the interface that I feel need refinement. There are a couple of less obvious reasons that I wanted to make this change before anything else, as well: first, it’s a necessary feature for the discussions feature coming up with groups/writing circles. Yes, you’re going to be able to chat in an organized discussion area inside of groups that allow it, and you’ll be able to use this comment editing feature as part of it. Discussions will rely on the site’s existing commenting architecture (although using a totally different layout), so it was important to shore up its deficiencies before plugging it into the groups feature. 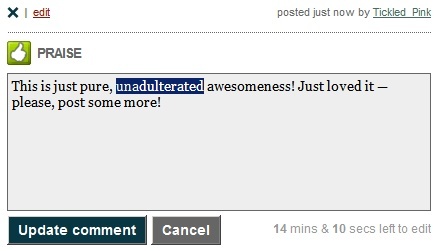 The other reason for adding comment editing was to help our future moderators in doing their job on the site; they’re going to need to be able to properly moderate, and this was one of the tools that they’ll have at their disposal to do that. 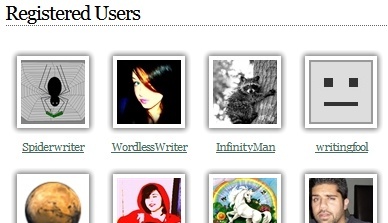 As a little extra incentive, those of you who invite the most new members to the site successfully will show up in the Top Community Promoters widget on the site’s main Authors page. A little way that I can say thanks to those of you making a concerted effort to bring fresh blood into the Protagonize community. This little upgrade is near and dear to my heart, although I’m not sure many of you are aware of it. Two or three weeks back, I revamped the Share window (you may have noticed the new shiny blue button on stories and author profiles) to allow you to share content a little easier. 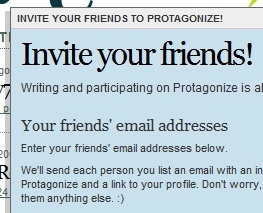 Now, not only can you share any page of a specific story (as opposed to solely entire stories and author profiles) via email, you can also share posts with your friends on the site. Better yet, you can just start typing your friend’s name, and the site will auto-complete and offer you suggestions based on what you’ve entered. And by friends, I mean mutual favourites — I implemented it this way on purpose to prevent you from being spammed by unscrupulous folks who you may not be friends with, but may have favourited you. On top of the improvements to the window, you’ll also receive email notifications (if you have them enabled in your profile) and updates on your notifications page if one of your friends shares an item with you. Again, I’m trying to improve the tools you have on the site to share and spread your content amongst both non-members and your favourite authors, so I’d encourage you all to try it out. A small, yet very important change; you can now include hyperlinks in author profiles, comments, and in the author guidance on stories. I haven’t added this feature into stories themselves as it would go against the purpose of stories and their pages, but it’s important to be able to link from other areas of the site, so I’ve turned on this ability. I had valid reasons for not allowing linking when I launched the site, but I think the way our members are using the site and the general lack of spam and advertising polluting the site’s content has gone a long way in terms of alleviating my fears on this subject. 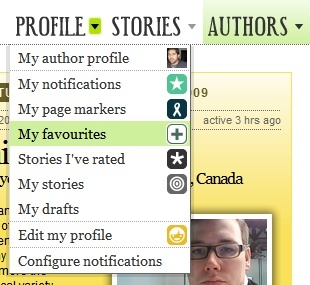 When editing your profiles, you’ll now notice a link in the editor’s toolbar to add a new link. 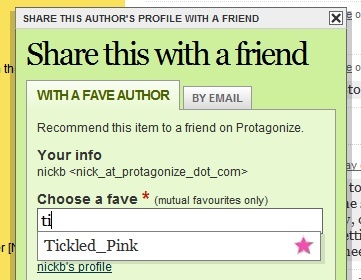 Feel free to use it to add links to your profiles, particularly to stories you’ve posted on the site. In comments and guidance, any links found by the site will be automatically linked for you. Just be warned that I’ll be keeping an eye out for reports about spam or linking to inappropriate or advertising-type content and removing bad links as necessary. While there are plenty of other usability enhancements I can make to improve your experience on Protagonize, I’m currently stopping work on all of those little tweaks to focus my time on solely one new feature: groups, also known around these parts as writing circles. Phase 1 will actually consist only of two groups controlled by myself: a contest that should be launching on the site shortly, and a Protagonize-specific group that I’ll be opening up to select beta testers. During the first phase, you’ll be able to participate in the contest I’ve mentioned, but you won’t be able to create your own groups just yet. I’ll be running this first phase for a couple of weeks, and using the Protagonize group as a control, allowing me to beta test functionality that will come in the next phase. Phase 2 will open up general group functionality to everyone. You’ll be able to do pretty much everything I have in mind with groups, including creating and maintaining your own groups, joining writing circles created by other authors, inviting Protagonize members and other folks to your new groups, and starting your own topics in discussion areas within them. I may or may not allow the ability to submit stories to groups in this phase; I haven’t decided if it will be allowed just yet, as it’s already going to be a pretty large undertaking without having that option available and complicating matters. Phase 4 will introduce Pro account features to groups and to the site in general. This is probably going to take a while for me to get to, but I intend to have it up and running by the time the summer hits. I’ll be posting more about this after groups are into their first couple of phases. The reason I’m breaking up writing circles into a series of phases is mainly so that I can get them out to our members before they’re totally complete. That way, I can count on our beta testers to go through features that may not quite be ready for prime-time and provide valuable feedback during the development of the latest phases that I wouldn’t have access to normally. I’m hoping you’re all as excited about what’s coming down the pipe as I am. Spring 2009 is going to be an interesting time for Protagonize! 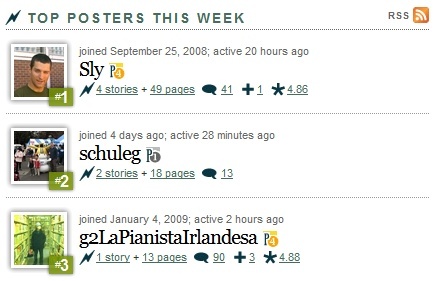 This entry was posted in Features, General, Previews, Site mechanics, Site updates and tagged 2009, community, Features, groups, preview, sharing, spring, tools, writing circles. Bookmark the permalink. Sounds awesome. I’m interested to see how the writing circle functionality effects the dynamic of the site. hurrah for updates! and a nice slough of them. I’m really looking forward to this Writing Circle implementation. We have a small group of writers over at colonyofgamers.com and I’d love to have the capability to do collaborative writing with a set group of people. I’ll be keeping an eye out; can’t wait! Looking forward to more info on all of it. Interesting Nick, I am currently in a writing group for one of my classes and it is definitely a good idea for collaborative stories! Hi Nick. what a wonderful idea> I can’t wait for the writers’ circles to be up and running. when do you think the contest will start? I’m definately interested in all of it! Good job, and happy belated birthday.